Spring Heeled Jack was an entity said to have been responsible for a number of attacks starting in 1837 AD. He was first seen in London. There were other, later sightings, in Liverpool and the Midlands. Who or What was Spring Heeled Jack? It is believed that some later sightings were copy cat hoaxes and pranks. "Who was the frightening figure - a man known only as Spring Heeled Jack - who terrorised the people of London for decades in the 19th century? The lonely lanes and commons of 19th Century suburban London were haunted by the weird and terrifying figure of Spring Heeled Jack, who pounced upon passers-by, sometimes wounding them severely, and bounded away in enormous leaps. 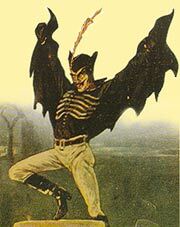 Today the antics of Spring Heeled Jack are almost forgotten, or dismissed as a figment of the imagination - a mere character of Victorian horror literature, or a bogeyman used by mothers to warn errant children: �Be good, or Spring Heeled Jack will get you!� Some writers believe that Jack is a figure of popular folklore. Kellow Chesney in his book The Victorian Underworld says that Jack is �pure legend� - perhaps the invention of servants reluctant to admit negligence when thieves robbed their master�s home. But Jack was not a character in fiction, folklore or legend. He was real, and his appearances were widely reported in the local and national press. Nobody seems certain when Jack first appeared. Many sources say that reports of a peculiar leaping man were in circulation as early as 1817, but it was not until 1838 that Spring Heeled Jack became a figure of considerable and widespread interest and speculation. We do not know why the Lord Mayor made the contents of the letter public, nor can we judge the truth of the letter�s allegation of a press �cover-up�, but from the quantity of letters that poured into the Mansion House it is clear that the activities of Spring Heeled Jack were common knowledge in suburban London. Spring Heeled Jack had appeared as a milk-white bull, a white bear, and an enormous baboon; he had been seen dressed in a suit of shining brass armour, and on one occasion in one of burnished steel; once, in Hackney, he appeared as a lamplighter - who walked upon his hands and carried his ladder between his feet. His ability to make prodigious leaps was popularly ascribed to springs attached to his boots. On Wednesday, 18th February 1838, 18-year-old Lucy Scales and her sister Margaret were returning home after visiting their brother, a butcher who lived in a respectable part of the district of Limehouse. Lucy slightly ahead of her sister, was passing the entrance to Green Dragon Alley when a figure leapt upon her from the shadows. The figure breathed fire into Lucy�s face and then bounded away as the girl fell to the ground, seized by violent fits. Jane fetched a candle, but when she handed it to the �policeman�, the man discarded his all-enveloping cloak. On his head was a large helmet, he wore a skin-tight suit of what looked like white oilskin, and in the light of the candle his protuberant eyes burned like coals. Without uttering a word, he vomited blue and white flames into Jane�s face and grabbed the temporarily blinded and very frightened girl with talon-like fingers, which tore her dress and raked her skin. Attracted by her screams, Jane�s sisters, Mary and Sarah, came to the girl�s assistance. Somehow Sarah pulled Jane out of the fiend�s grasp, thrust her inside and slammed the door in Jack�s face. A week later Jack tried the same deception but for some reason his intended victim was suspicious and Jack was forced to flee. A witness claimed that under his cloak Jack had been wearing an ornate crest and, in gold filigree, the letter �W�. After these attacks Jack�s infamy grew. His exploits were reported in many newspapers and became the subject of at least no less than 4 �penny-dreadfuls� and melodrama�s performed in the cheap theatres that abounded at the time. But, perhaps as a result of the publicity, Jack�s appearances became less frequent and appeared over a large area. I was not until 1843 that terror of Spring Heeled Jack again swept the country. Then he appeared in Northamptonshire, in Hampshire - where he was described as �the very image of the Devil himself, with horns and eyes of flame� - and in East Anglia, where he took particular delight in frightening the drivers of mail coaches. In 1845 reports came from Ealing and Hanwell, in west London, of a weird figure, leaping over hedges and walls and shrieking and groaning as it went. The perpetrator turned out to be a practical joker, a butcher from Brentford. Later that year Jack was seen at Jacob�s Island, Bermondsey, a disease-ridden slum of decaying houses linked by wooden galleries across stinking ditches. This area had been immortalised by Charles Dickens seven years earlier as the lair of Fagin and his motley band in Oliver Twist. Jack cornered a 13-year-old prostitute named Maria Davis on a bridge over Folly Ditch. He breathed fire into her face and hurled her into the stinking, muddy ditch below. The girl screamed terribly as the muddy waters claimed her. Witnesses reported the affair to the police, who dragged the ditch and recovered the poor girl�s body. The verdict at the subsequent inquest was one of death by misadventure, but the inhabitants of the area branded Jack as a murderer. In 1877 Jack gave a virtuoso performance at Aldershot Barracks. The terror began one night in early March. A sentry on duty at the North Camp peered into the darkness, his attention attracted by a peculiar figure bounding across the common towards him. The soldier issued a challenge, which went unheeded or unheard, and the figure disappeared from sight for a few moments. Then it was beside the guard and delivered several slaps to the face with a hand as cold and clammy as that of a corpse. There were several more attacks on guards at Aldershot. Once a soldier shot at Jack; afterwards a rumour that Jack was invulnerable to bullet-fire spread like wildfire. In fact the soldier had fired blanks at him. Various theories were advanced at the time, but no real clues ever emerged. The identity of the miscreant and the purpose of his attacks remains unknown."